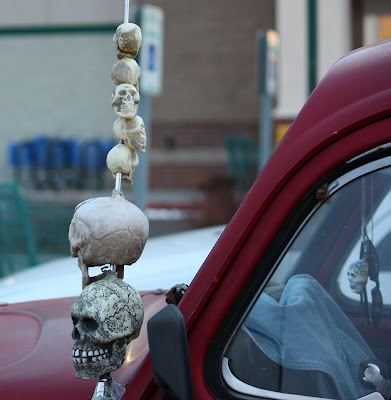 Interesting antenna decorations. I'm sure it means something...I just don't know what. To what total weirdness people aspire! Is this a sense of humor, or an attention-grabber, or just morbidity? I wonder. Maybe it means the VW is a death trap??? Its either stay out of his or her way or your next. Pygmy collection. Metalheads for sure. Cool! I wouldn't choose skulls, but I like the idea. Great capture! I would go with cannibalistic. Just a bit too morbid for my taste.